Department of Dravyaguna, SDM College of Ayurveda. SDM Centre for Research in Ayurveda and Allied Sciences, Udupi 574118, India. Correspondence to: CITE THIS RESEARCH AS Soman P, Mohammed F, Prabhu S. Pharmacognostical and Phytochemical Evaluation of Tender Leaves of Bhumijambu – Syzygium caryophyllatum (L.) Alston. J Ayu Med Sci 2018;3(1):304-10. Bhumijambu is the fruit of plant which is botanically known as Syzygium caryophyllatum (L.) Alston belonging to the family Myrtaceae. Though it is mentioned in the classics as a variety of Jambu, more uses can be traced from the folklore practitioners. Its tender leaves are mainly used in the treatment of stomatitis, diarrhoea, watery blood mixed stools, blood and mucous mixed stools, wound and ulcers. The tender leaves of Syzygium caryophyllatum was collected before the flowering season and authenticated. Macro-microscopic, physico chemical standards, preliminary phytochemical study, HPTLC were recorded scientifically. The leaf was peculiar in containing rosette crystals and collateral vascular bundle which is closed type The result of preliminary phyto chemical test showed the presence of alkaloid, saponins, flavanoid and carboxylic acid. HPTLC photo documentation showed the presence of phyto constituents with different Rf values and densitrometric scan of the plates showed numerous bands under 254nm, 366nm, 620nm (after derivatisation). Conclusion: The findings of the study will be helpful to authenticate pharmacognostic standardization of the plant material, assist in the preparation of herbal monograph for the species. Ayurveda is the science that was in the confinement of several things has basked in its glory and heading towards globalization. The plants with medicinal properties have been successfully utilized for centuries in the treatment of various ailments with varying degrees of severity. Syzygium caryophyllatum (L.) Alston is a small evergreen tree or a large shrub with edible purple black coloured fruits which belongs to the family Myrtaceae, distributed in the mid altitude of the Western Ghats region of Kerala, Karnataka and Tamilnadu[1,2]. In Ayurveda the references are available in samhita and Nighantu period under different sub names like Bhumijambu, Jambu Dvaya, Kakajambhu, Nadeyi, Pikabhaksha etc., which can be identified as S. caryophyllatum. The tender leaves of S. caryophyllatum are widely used by the folklore practitioner’s especially for stomatitis, diarrhoea, stools with blood and mucous, wound and ulcers. Pharmacognosy deals with Identification or authentication of crude drugs from natural origin. The herbal medicines which are cost effective, having specific healing properties and specific actions demands its higher requirement. 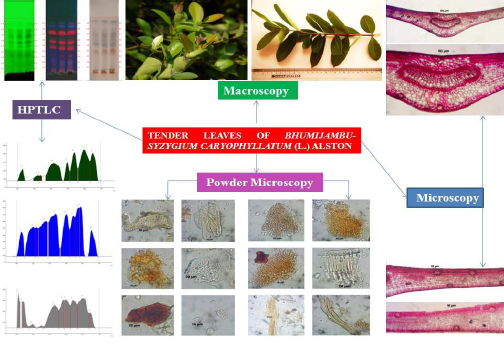 In the present study, macro-microscopic, preliminary phytochemical and physico chemical characters were carried out on the dried tender leaves of S. caryophyllatum and HPTLC finger printing was carried out onethanolic extract. The tender leaves ofS. Caryophyllatum was collected from Udupi and authenticated by Pharmacognosy Unit of SDM centre for Research in Ayurveda and Allied Sciences Udupi (Voucher No. TRR/875/17031405). The tender leaves were collected in wet form before the flowering season; cleaned from the extraneous matter, shade dried and was made into coarse powder for further studies . The external featuresof thetender leaves of S. caryophyllatum observed through naked eye and it was documented using Canon IXUS digital camera. 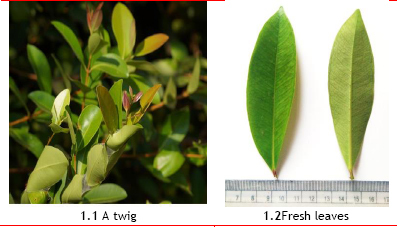 Features of the test sample were compared to local flora for authentication . The transverse sections of tender leaves were stained with safranine; iodine in potassium iodide for detection of starch. Transverse sections were photographed using Zeiss AXIO trinocular microscope attached with Zeiss Axio Cam camera under bright field light. Magnifications of the figures were indicated by the scale-bars. Pinch of leaves powder mounted in glycerine and powder characters were observed under the Zeiss AXIO trinocular microscope attached with Zeiss Axio Cam camera under bright field light. Thetender leavespowder was tested for pharmacopoeial constants like loss on drying at 105°C, total ash, acid insoluble ash, water soluble ash, alcohol soluble extractive and water soluble extractives. Preliminary phytochemical tests were carried out to find out the presence of alkaloids, carbohydrates, steroids, saponins, tannins, flavanoids, phenol, coumarins, triterpenoids, carboxylic acid, resin and quinone. One gram of leaves powder was extracted with 10 ml of ethanol. 3, 6 and 9μl of the above extract were applied on a pre-coated silica gel F254 on aluminum plates to a band width of 7 mm using Linomat 5 TLC applicator. The plate was developed in n-hexane: ethyl acetate (7:3). The developed plates were visualized under short UV, long UV, and then derivatised with vanillin sulphuric acid and scanned under UV 254nm, 366nm and 620nm. Rfvalue, colour of the spots and densitometric scan were recorded. Shape of the fresh tender leaf collected is obovate or oblanceolate, obtuse or sub acuminate at apex. Numerous lateral nerves are present and are parallel. Base is narrow with a short petiole (Figure 1). Transverse section of the tender leaf shows single layered epidermis. Mesophylls cells are present. Palisade - elongated single layered cells having cluster of calcium oxalate crystals. Spongy parenchyma with inter cellular spaces followed by single layered lower epidermis which is continuous towards the mid rib and lamina. 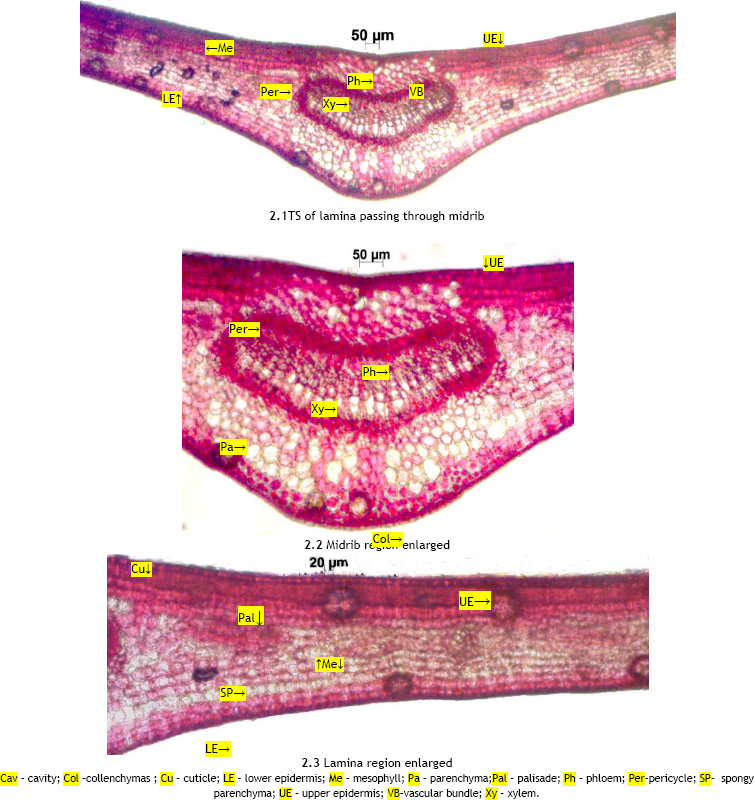 Mid rib - Brown tissue is mostly parenchymatous having centrally arranged single collateral closed vascular bundle having xylem in the center and phloem in the periphery. A patch of pericyclic fiber covers the phloem (Figure 2). 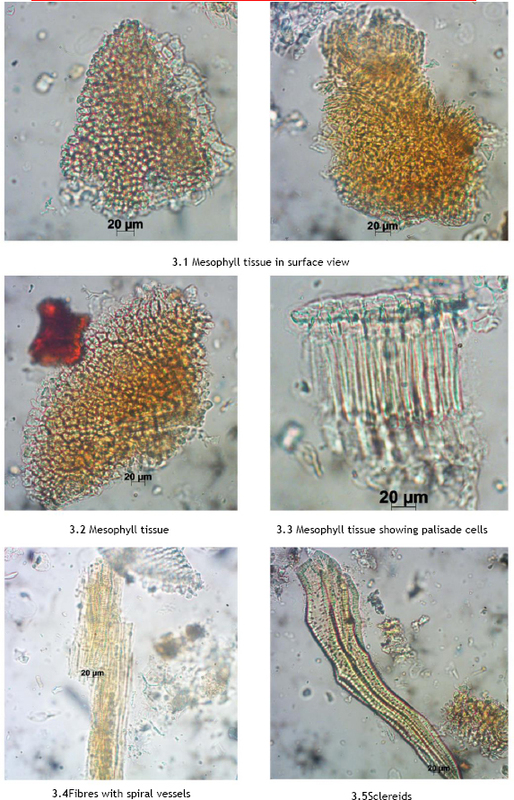 Thetender leaves powder of S. caryophyllatum shows fragments of mesophyll cells. Mesophyll cells showing abundant palisade cells and the thick fibres with spiral vessels interlock with each other to form a bundle which is characteristic to form a spindle shaped structure. Abundant single isolated or groups of pitted sclereids of various sizes and shapes with a large lumen. Abundant cork cells and brown masses are seen. Thin and thick walled pitted vessels are present. 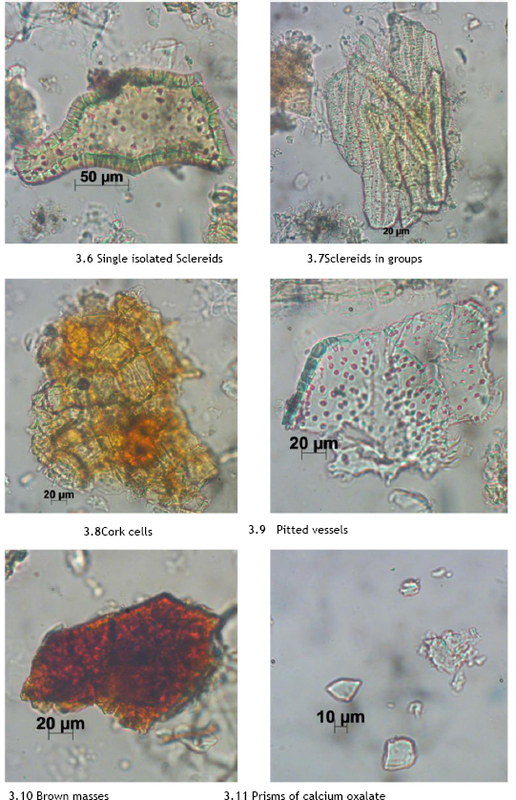 Abundant prismatic crystals of calcium oxalate of various sizes and shapes (Figure3). This standard testing will contribute directly or indirectly to the safety, efficacy and acceptability of the drug and its products. The results of physico chemical parameters are mentioned in (Table 1). Preliminary phytochemical tests are needed for the identification of the basic constituents present in a drug. Effect of a drug is dependent on the constituents present in it. So this analysis will help to know about the chemical constituents present in S. caryophyllatum Linn. Here test for alkaloids (Dragendroff’s test, Wagner’s test, Mayer’s test, Hager’s test), carbohydrates (Molisch’s test, Fehling’s test, Benedict’s test), steroids (Libermann-Burchard test, Salkowski test), saponins, tannins, flavanoids (Shinoda’s test), phenol, coumarins, triterpenoids, carboxylic acid and quinone were conducted and result depicted (Table 2). HPTLC fingerprint of ethanol extract of S. caryophyllatum was obtained with the suitable solvent system. Rfvalue and colour of the spots in chromatogram developed in n-hexane: ethyl acetate (7.0: 3.0) for ethanolic extract of plant was recorded. 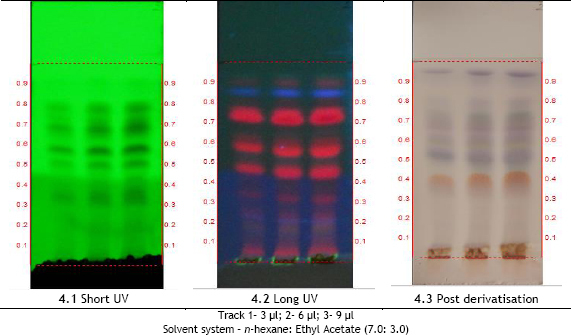 HPTLC photo documentation revealed presence of phyto constituents with different Rf values and densitrometric scan of the plates showed numerous bands under short UV, long UV and white light (after derivatisation). On photo documentation under short UV, there were 7 spots were evident with 0.32 (D. green), 0.36 (D. green), 0.51 (D. green), 0.57 (D. green), 0.68 (D. green), 0.73 (D. green), 0.80 (D. green). On photo documentation under long UV there were 11 spots in the leaf extract of S. caryophyllatum such as 0.04 (FD. red), 0.17 (FD. red), 0.20 (FD. red), 0.24 (FD. red), 0.32 (FD. red), 0.45 (FD. red), 0.57 (FD. red), 0.73 (FD. red), 0.85 (F. blue), 0.90 (FL. blue), 0.94 (FL. Green) respectively. On photo documentation under white light (after derivatisation) with vanillin sulphuric acid reagent 11 spots were evident with Rf0.17 (L. purple), 0.27 (L. purple), .041 (D. orange), 0.51(D. purple), 0.57(L. green), 0.61(L. purple), 0.66 (D. purple), 0.70 (L. green), 0.73 (D. green), 0.80 (L. purple) and 0.94 (D. purple) respectively(Figure 4),(Table 3). 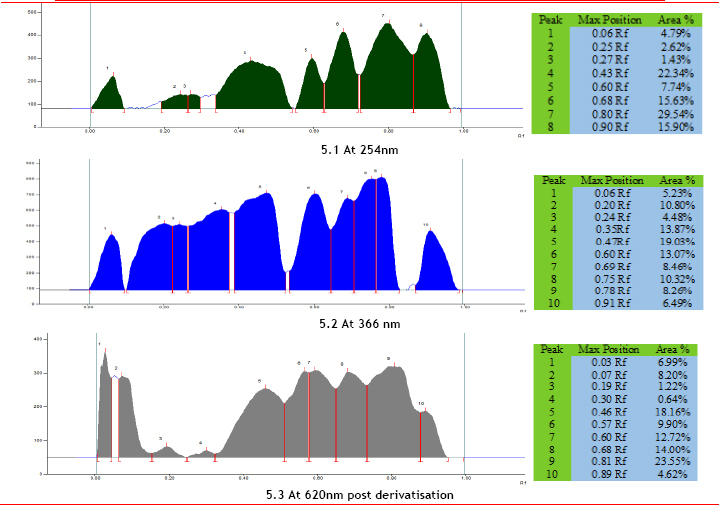 Densitomertric scan at 254nm, S. caryophyllatum leaf revealed 8 peaks corresponding to 8 different constituents in ethanol extracts with Rf 0.01 (4.79%), Rf 0.19 (2.62%), Rf 0.27(1.43%), Rf 0.34(22.34%), Rf 0.55(7.74%), Rf 0.63 (15.63%), Rf 0.73 (29.54%) and Rf 0.87 (15.90%) were the major peaks. Densitrometric scan at 366 nm, S. caryophyllatum leaf revealed 10 peaks corresponding to 10 different constituents in ethanol extracts with Rf 0.00 (5.23%), Rf 0.10 (10.80%), Rf 0.23(4.48%), Rf 0.27 (13.87%), Rf 0.39 (19.03%), Rf 0.54 (13.07), Rf 0.65 (8.46%), Rf 0.71 (10.32%), Rf 0.77 (8.26%), Rf 0.87 (6.49%) were the major peaks. Densitrometric scan at 620 nm, S.caryophyllatumleaf revealed 10 peaks corresponding to 10 different constituents in ethanol extracts with Rf 0.01 (6.99%), Rf 0.06 (8.20%), Rf 0.15 (1.22%), Rf 0.25 (0.64%), Rf 0.33 (18.16%), Rf 0.51 (9.90%), Rf 0.58 (12.72%), Rf 0.65 (14.00%), Rf 0.74 (23.55%), Rf 0.88 (4.62%) were the major peaks(Figure 5). The study of tender leaves of S. caryophyllatumh as never been carried out before so this was an attempt to ascertain the true identity by carrying out its pharmacognostic study and hence authenticate the specimen and give a voucher specimen number for the same. The leaf was peculiar in containing rosette crystals and collateral vascular bundle which is closed type. Evaluation of the physico chemical parameter which is necessary for establishment of its quality, purity and collection practices as ash value is indicative of inorganic matter present, extractive value as whether the drug is excessively exhausted or the contents are within the permissible limits. The ash content is minimal gives the clue that the plant is containing less amount of inorganic matter. Preliminary phyto chemical tests were conducted using the alcohol (ethanol) soluble extracts and these tests are the primary method to know about the chemistry of the plant. HPTLC performed will serve as a finger print of the constituents present with different Rf values which are unique to S. caryophyllatum. Before the inclusion of any crude drug in pharmacopoeia it is important to establish its well-defined pharmacognostic parameters and standards. S. caryophyllatum is a large evergreen shrub or a small tree belongs to the family Myrtaceae. The drug Bhumijambu is mentioned as a variety of Jambu in classics with its limited therapeutic benefits. The transverse section of leaf showed single layered epidermis and palisade cell which are elongated and having clusters of calcium oxalate crystals in the mesophyll region. Physico-chemical study and HPTLC gives the fingerprinting profile of the drug and the preliminary phyto chemical study reveals its chemical profile. In Physico chemical study showed loss on drying was 13.75%w/w, total ash value 3.86%w/w, acid insoluble ash value was 0.15%w/w, water soluble ash value was 1.90%w/w, alcohol soluble extractive value was 7.98%w/w and the water soluble extractive value was 10.78%w/w. Phytochemical study shows the presence of alkaloids, flavanoids, saponins and carboxylic acid. HPTLC photo documentation revealed presence of phytoconstituents with different Rf values and densitrometric scan of the plates showed 8 bands under 254nm, 10 bands under 366nm and 10 bands under 620nm(after derivatisation). Authors are grateful to revered President Dr. D. Veerendra Heggade, SDM Educational Society for constant his encouragement. Authors are indebted to Dr. Shreekanth U, Principal SDM Udupi and Dr. B. Ravishankar, Research Director SDM Centre for Research in Ayurveda and Allied Sciences, Udupi for their support. Dr Parvathy S carried out the whole research work, collection of plant material, pharmacognostical and phytochemical study was done. Report was collected and arranged systematically. Dr Mohammed Faisal is the guide for this work, actual planning, advices, timely suggestions were given by him for the preparation of this paper. Suchitra Prabhu, has provided proper guidance and supervision for the study until the finalization of the paper.